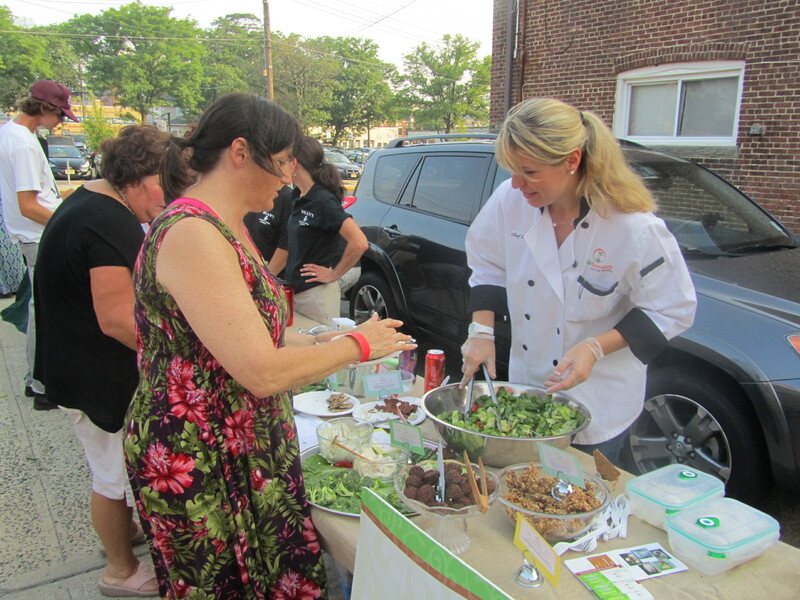 Last Thursday I attended a fabulous event in Red Bank, New Jersey – the premiere of the new documentary Forks Over Knives. The documentary is based on the work of Dr. T. Colin Campbell, author of The China Study, the most comprehensive study on health and nutrition ever conducted. Tickets quickly sold out for the first show at 7 pm with more than 200 people coming to see it. A big success! The movie closely resembles the finding in Dr. Campbell’s book. Without giving out too much details, the main message is to show the viewers how the over-consumption of animal products has led to many of the health problems polluting our bodies today. In addition to the scientific evidence, the movie follows the journeys of a few people, showing their remarkable transformation after adopting a plant-based diet. If you have seen Food Inc. or Food Matters, you would definitely enjoy Forks Over Knives. It will continue your education toward healthier eating habits and it will make you more conscientious of your food choices. Check out the movie’s website to find out when it will be showing in theater near you http://forksoverknives.com/. Having RAWbundant as one of the several food vendors at the reception prior to the screening was an honor. We had a table full of our Signature Products – Feta & Cream Cheezes, Flax Crackers, Sprouted Grawnola, Macaroons and Portabello Sunburgers. I also made two huge bowls of my Bulgarian Feta Cheeze Salad which was a big hit. Some of the other vendors were Dean’s Natural Food Market, Good Karma Vegan Cafe, Papa Ganache, The Cinnamon Snail, Veggie Brothers and Whole Foods. The BEST thing about the Red Bank premiere was that Dr. Campbell was there. I had the chance to meet him prior to the showing at my RAWbundant table. It was such an honor and privilege to shake his hand and serve him some of my raw vegan foods. Following the movie, Dr. Campbell was gracious enough to answer questions from the audience. When my turn came, I began by telling him that it’s because of his book The China Study, that I chose to become vegan two years ago. No other health book has ever changed my life in such positive way before. Consequently, I launched my company RAWbundant with the goal to offer people more healthy plant-based products to incorporate into their diet. My gratitude to Dr. Campbell is beyond words can describe. Then I asked him a questions that has been pressing my mind for a while. I’ve been wondering if eating only organic, grass-fed and free-range animal products makes any difference. Some people believe that by consuming ethically sourced meat, eggs and dairy, they are doing less damage to their body. So my question to Dr. Campbell was if he has seen any difference in people who eat one versus the other. While he has not studied such circumstances, he was confident that there would be no difference in the outcome. Because the chemical composition of meat, milk and eggs is essentially the same regardless of how they are sources, eating organic grass-fed and free-range products would still has the negative impact on your body as the processed, factory produced counterparts. That was a big revelation. I will make sure to pass it along in my future classes and workshops. Many thanks to the organizers Patti Langan Siciliano from Funk & Standard and Jen Portman from Synergy Hot Yoga, for bringing such an amazing experience to our local community. And thanks to Dr. Campbell for coming and sharing his wisdom and knowledge. For more of his work, I recommend that you check out his foundation website http://www.tcolincampbell.org/.